Perispinal injection is a novel emerging method of drug delivery to the central nervous system (CNS). Physiological barriers prevent macromolecules from efficiently penetrating into the CNS after systemic administration. Perispinal injection is designed to use the cerebrospinal venous system (CSVS) to enhance delivery of drugs to the CNS. It delivers a substance into the anatomic area posterior to the ligamentum flavum, an anatomic region drained by the external vertebral venous plexus (EVVP), a division of the CSVS. Blood within the EVVP communicates with the deeper venous plexuses of the CSVS. The anatomical basis for this method originates in the detailed studies of the CSVS published in 1819 by the French anatomist Gilbert Breschet. By the turn of the century, Breschet’s findings were nearly forgotten, until rediscovered by American anatomist Oscar Batson in 1940. Batson confirmed the unique, linear, bidirectional and retrograde flow of blood between the spinal and cerebral divisions of the CSVS, made possible by the absence of venous valves. Recently, additional supporting evidence was discovered in the publications of American neurologist Corning. Analysis suggests that Corning’s famous first use of cocaine for spinal anesthesia in 1885 was in fact based on Breschet’s anatomical findings, and accomplished by perispinal injection. The therapeutic potential of perispinal injection for CNS disorders is highlighted by the rapid neurological improvement in patients with otherwise intractable neuroinflammatory disorders that may ensue following perispinal etanercept administration. 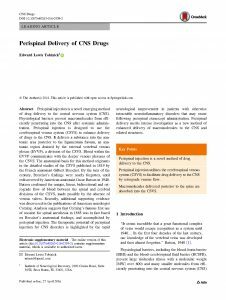 Perispinal delivery merits intense investigation as a new method of enhanced delivery of macromolecules to the CNS and related structures.